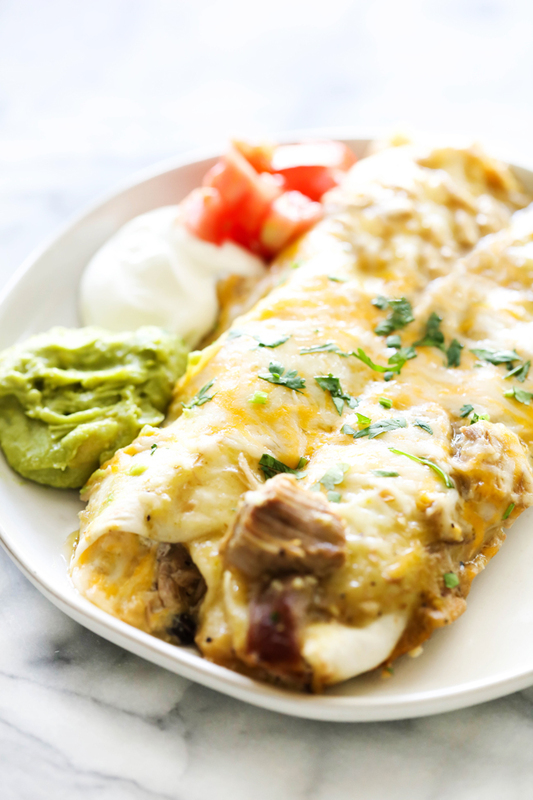 These Chile Verde Pork Enchiladas are such a flavorful seasoned meal and will have everyone smiling at the dinner table. They have a creamy filling and saucy exterior. The pork is tender and infused with flavor. We just got back from a fun labor day family vacation. Getting back into the swing of school and extra activities has been the goal this week. Dinner always needs to be quick on busy days, and this one fits that criteria. The pork is cooked in a slow cooker for about 5 hours. Then when the pork is done and I am about 35 minutes from when I want the family to sit down for dinner, I assemble these Chile Verde Pork Enchiladas and pop them in the oven. It is so simple to make and one of my family’s favorites. The creamy filling is a focal point of the recipe. It adds a great balance to the sauce and the cheese. All the ingredients work so well together. In a small mixing bowl combine cream cheese, ½ teaspoon salt, and black beans. Spread about 2 to 3 Tablespoons of the cream cheese/bean mixture lengthwise in the center of a tortilla. Spoon about ⅓ cup of the pork over the cream cheese. Sprinkle about 2 to 3 Tablespoons of cheese over the top of pork. Roll enchilada tightly and place in baking dish. Repeat this until you have filled each of the 10 tortillas. Pour the rest of the chili Verde sauce over the enchiladas and bake at 350 degrees F. for 25 minutes. 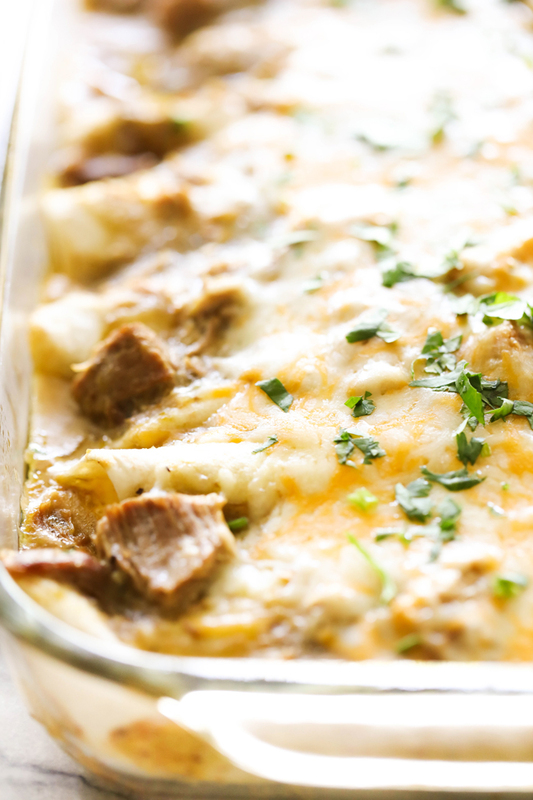 Remove enchiladas from the oven and sprinkle the remaining cheese over the top of the enchiladas and then return enchiladas to the oven for another 5 to 8 minutes or until the cheese is melted.